you are here : home > land & property > Wanphum Estate Co., Ltd.
Wanphum Villas is one of the most exclusive villas offering a tranquil setting, located on Chalong hillsides, overlooking a mountain view . The villas can easily accessible to the beach, Phuket City, golf course, main shopping area including Central Departments or Big C, Tesco -Lotus and just twenty minutes to International College. Composed of two types of 7 independent villas, using only the finest materials, designed for your personal comfort and unending pleasures, all offering a private Swimming pool, 3 bedrooms, open-air living room, fully fitted kitchen & modern bathroom appliances, covered parking . 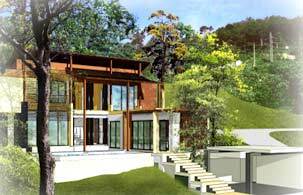 Customization of each villa is generous in size, ranging from 450 - 680 sqm. Each villa has its own ample water supply & all utilities are underground.